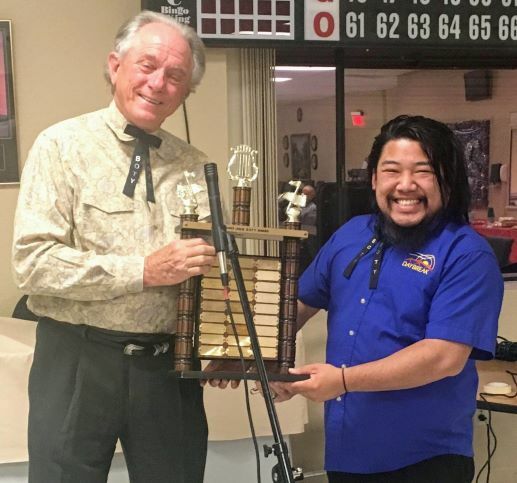 Director Mike Vo was awarded 2018 Barbershopper of the Year honors at the annual Chapter banquet January 13th. Mike was selected unanimously by previous BOTY winners that are still active in the Chapter. The award goes to that person in the Chapter that contributes most to the success of the organization. He stepped up to direct the chorus, attend Harmony University Director College, and write the scripts for both our Christmas and 2019 Annual Shows. He was instrumental in getting rehearsal space in St Demetrios Church - significantly reducing costs to the chapter. Congratulations Mike.